Note: All graphics used in this article and linked to material has been made from scratch by me using scans of original game components. 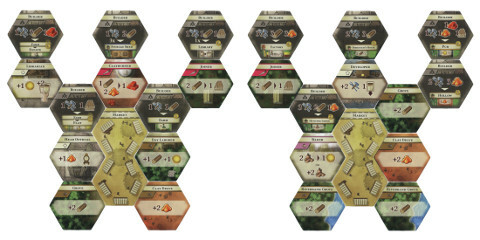 The scenario Kaizo Colonists for The Colonists board game was released in Lookout Spiele‘s German magazine Ausguck a few months ago, and based on previous experiences with the scenarios, we can’t be sure that there will ever be an English version. So now that some time has passed, to aid non-German speaking people, I’ve created an unofficial English version of the scenario just like I did for the scenario The Alliance Of The Six Citites. Due to BGG‘s policies on using copyrighted materials, I can’t post my work there. Instead, it’s available from this page. I hope you’ll enjoy it. In case that Lookout ever publishes the official English version of the scenario, my work here will be removed and I’ll instead link to the official version. If you use this scenario, I strongly encourage you to support Lookout Spiele by buying their magazine. Download the player board from here (current version number is 1) (current version number is 1). The document contains two pages. The two parts can be laid out next to each other, as long as they don’t touch. The only way to move from one part to another is to jump to their markets. Note: If you prefer not to print this document, the board can also be created using the place tiles from the original game. If you find any errors in the rules below or the player board, please don’t hesitate to contact me. Kaizo Colonists – A solo scenario for “The Colonists”. Anyone who knows about modern internet culture will know the name “Kaizo Mario”, an ultra hard version of the console game “Super Mario World” from Nintendo. This scenario was made outrageously hard in the same manner as “Kaizo Mario” and should provide a real challenge to you. Who dares? The scenario begins and ends in Era I and is played without colonies. Your goal is to employ a citizen within ten half-years. That sounds easy, right? You probably need to convince yourself of the opposite. 1. Use the provided board. All places are available from the beginning and no places are added during the game. 2. Colonies are not used. 3. Remove from the game all “Building contract” improvement cards (card numbers 114 through 120) along with the “Ticket” (card number 135). 4. At the markets you may only perform “sale” and “subsidy”, i.e. you are not allowed to use “action” at the bottom of the market cards. The game ends after one era. You win the game if you have employed a citizen. You will only become a true champion if your community is worth at least 50 dollars. Good luck! This entry was posted in Ikke-kategoriseret on 17.11.2017 by admin. Alternative byggevejledninger til LEGO-sæt nr. 544?